Preheat oven to 150ºC (300°F). Place half the lattice biscuits, sugar-side down, in the base of a 20cm x 30cm slice tin lined with non-stick baking paper and set aside. Place the cream cheese, sugar, golden syrup and vanilla in an electric mixer and beat for 4–6 minutes or until smooth and the sugar is dissolved. Add the eggs and beat to combine. Add the salt and mix to combine. Spoon the mixture into the slice tin and tap to remove any bubbles. 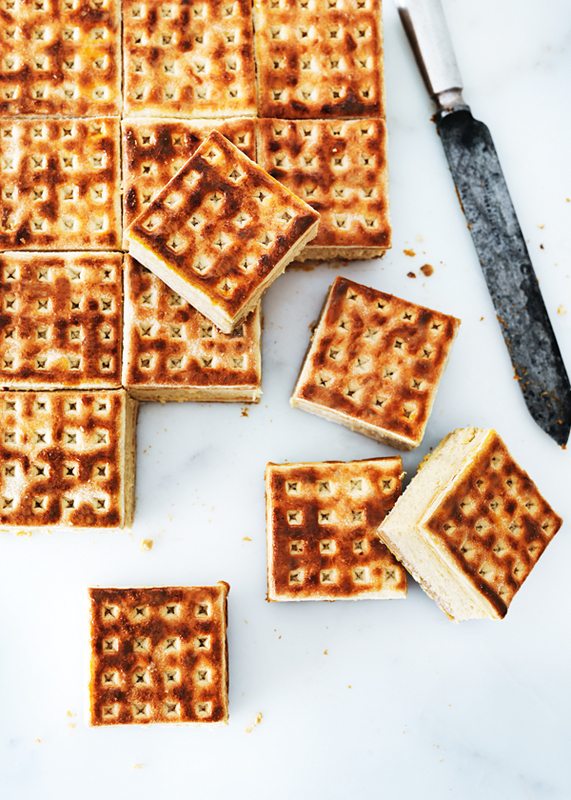 Top with remaining lattice biscuits, sugar-side up, and bake for 50 minutes or until the cheesecake is just set. Allow to cool slightly before refrigerating for 1 hour or until cold. Slice into sandwiches to serve. Serves 8–10. + You may need to trim a few biscuits with a serrated knife to enable them to fit into the tin.